The IT department has recently notified for changes in the present audit report format. It has now been stated that both Non-salaried professionals and business entities having gross receipts over Rs 50 lakh and 1 Crore respectively will now have to furnish their GST and GAAR (General Anti Avoidance Rules) details in their annual audit report which is to be submitted to the department for FY 17-18. Widening the scope of tax auditors reporting to the department, CBDT has revised Form 3CD. As per IT officials, the change has been proposed to seek all financial details from entities which will facilitate data mining, analytics of business financials and will curb out all major tax evasion possibilities. – Details of transactions related to TDS. – Particulars related to parties transacted with, other than for tax issues like payment or receipt of excess interest. – Details relating to transactions covered under transfer pricing provisions. -Transactions falling under composition scheme provisions etc. As per the latest notification of department, the requirement for all specified details would come with effect from August 20, and all business entities with a turnover gap of Rs 1 Crore ( 2 Crore for entities adhered under presumptive taxation ) & especially the non-salaried professionals having a gross receipt over Rs 50 lakh have to comply to these audit requirements. Earlier, the due date for filing a well-formatted audit report was affixed to September 30, while for entities with transfer pricing provisions the due date was posed to November 30. By seeking more powers and responsibility of auditors now they have been prescribed to determine their client access to impermissible avoidance agreements which were to be reported in GAAR particulars in new FORM 3CD. Taxpayers as earlier were only required to submit some limited particulars of TDS deductions to file a periodical statement of transactions for regulatory provisions. While now in the new Form 3CD, tax auditors would now have to ensure detailed filling of all related transactions related to TDS (Tax Deducted at Source). The proposed changes made various tax experts comment that it was always the responsibility of auditors to go through a detailed path on all transactions earlier also while filling the AUDIT FORM 3CD rather than resorting to only large transactions which is what they have to do now. Also, the audit requirement of the auditor cannot be closed by just providing the GST registration details of the taxpayer while now the auditor has to deeply dive into the taxpayer GST payments and receipts to specify conclusions in the new audio format. Other than all this, the auditor now have to bifurcate all expenditures related to exempted transactions and cases falling under Composition scheme which might range to a hundred transactions to thousands, which all need to be well studied by the auditor. On recent update of the department on all the above-stated provisions, even the top business experts commented that even earlier the format for filing audit was too time-consuming while now with the additional detailed requirement of IT department it will seemingly take too long time and procedures to be completed. Also, it might be possible that parties which transacted with taxpayer could not be the personal clients of tax auditor and could even be in other countries; hence it would be difficult for the auditor to specify their details. 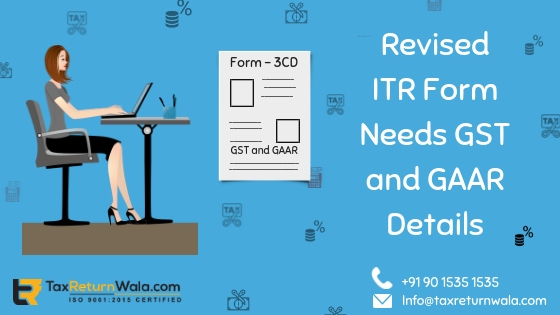 Make Your Business GST Complied with TaxReturnWala Today !